Thanks again to all who came out for the book launch party at Red Balloon on Sunday. So good to see all the smiling faces. If you couldn’t make it, I’ve got a few more events scheduled—in both the Twin Cities and Iowa—in the coming weeks. Please come (see sidebar for details)! 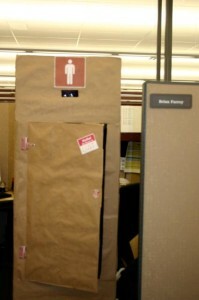 Those who know where I work know that Halloween is taken VERY seriously. Every year, all the departments pick a theme and dress accordingly. There are prizes for best costume, best department, etc. 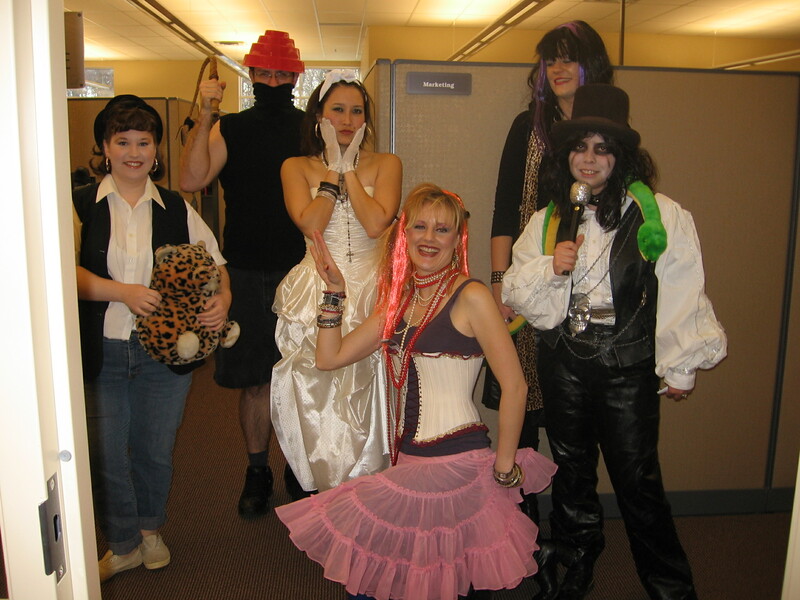 So as I prepare for tomorrow’s costumetravaganza (sorry, can’t tell you what our theme is yet on pain of torture), I thought I’d take a stroll down memory lane and revisit past costumes themes over the years. Here I am in my publicity days (I think this is circa 2006?) Our theme was 80s pop icons (that’s me as DEVO; you might also see Debbie Gibson, Cyndi Lauper, Madonna and Alice Cooper). I think we won best department that year. We’d also won the previous year for our theme: Six Degrees of Johnny Depp. We all came as different JD characters. Sad I can’t find a photo of that. I was Edward Scissorhands. Don’t have a group photo here. This was also from the publicity days. 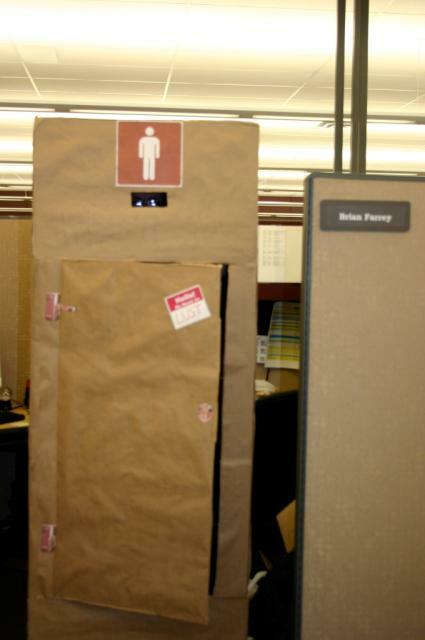 Our theme was “Seven Deadly Sins–Minnesota Style.” I was Lust (that’s me in a portable bathroom stall, tapping my foot like Larry Craig). 2007, I believe? I moved to acquisitions in 2008. 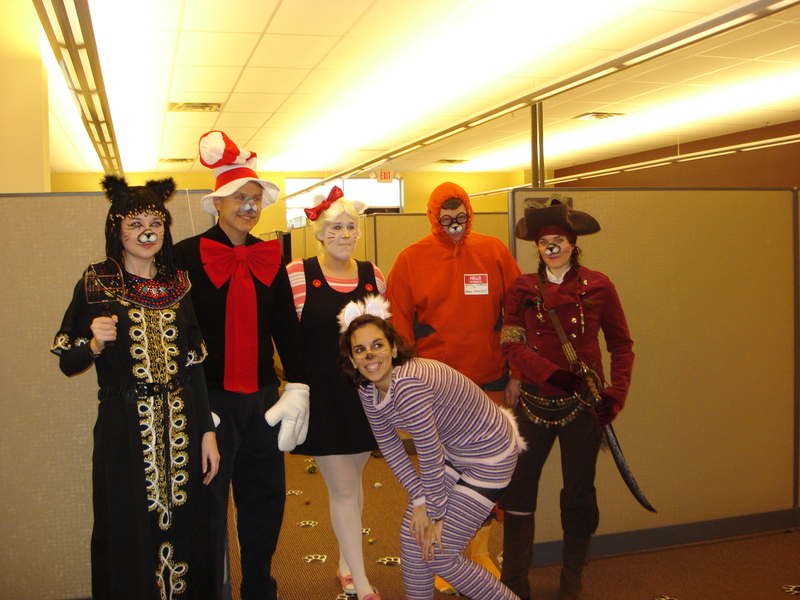 Our theme that year was famous cats. That’s me as Catbert. 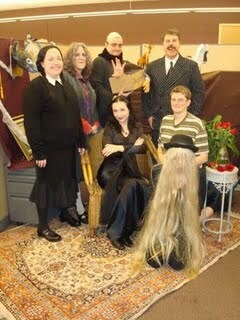 The next year, we were the Addams Family. So can’t believe we didn’t win best department. 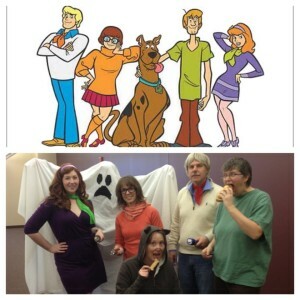 We nailed it. I won a prize for double duty as Uncle Fester and Thing. 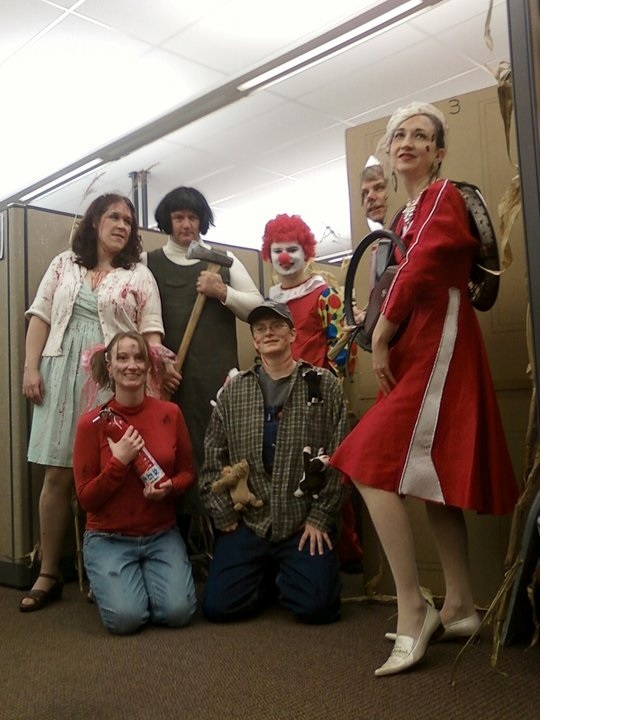 Then our theme was Stephen King. Not sure this was one of our better years. That’s me as Kathy Bates (MISERY). I was out of the office the year we did Ghostbusters (sad) but last year we did the Scooby Doo gang (I’m the ghost). I thought we did pretty good here as well. And this year’s theme? Wait and see…. 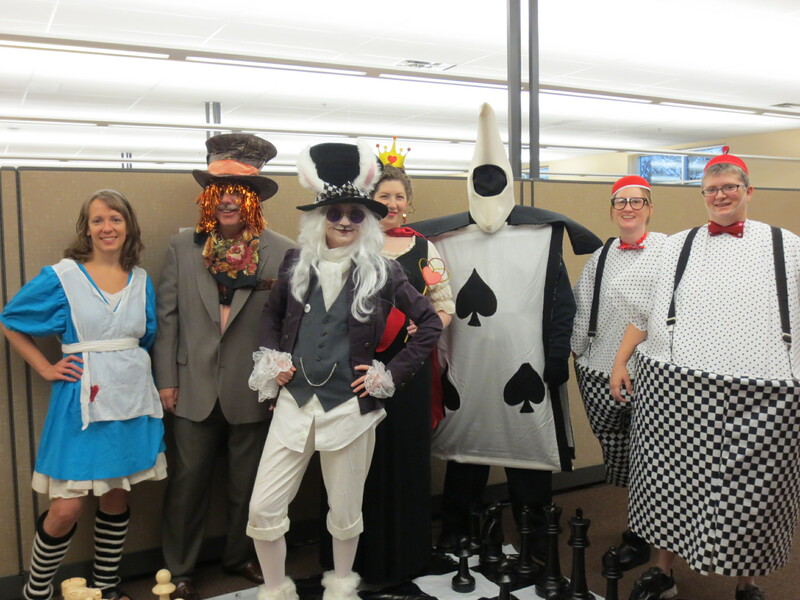 This year’s theme: Alice in Wonderland. I am the Card Guard. The blog was looking a little lonely. Thought I’d give it something to do. Good thing I’ve got a new book out. Yes! That’s right. Starting today, in bookstores across the nation, you too can own a copy of THE SHADOWHAND COVENANT, the sequel to last year’s THE VENGEKEEP PROPHECIES. Booklist calls the book “arch and vivid, creating by turns giggles, groans, and elevated heartbeats.” I’ll take it! Jaxter and his family of thieves have returned with their own special brand of mayhem. But whereas I think of VENGEKEEP PROPHECIES as a quest book, I think of SHADOWHAND COVENANT as a mystery. We’re introduced to the Shadowhands, a covert cadre of the most elite thieves in all the Five Provinces. They operate on the highest level of secrecy, taking common jobs to hide their true vocation. Anyone could be a Shadowhand: the baker, your neighbor…even members of your own family. Jaxter is thrown into the investigation when he learns that the Shadowhands have begun vanishing one…by…one. Who is responsible for the disappearances? Why have the magic-wielding Palatinate gone into hiding? And how is it all connected to the band of magic-hating nomads currently being sought by the High Laird? 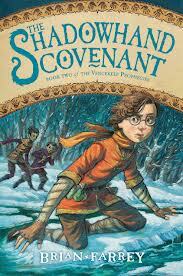 For more info, check out the Middle Grade page. Also out today: the paperback version of VENGEKEEP PROPHECIES. Hardcovers not your speed? We gotcha covered. The paperback of VENGEKEEP has been precisely engineered to fit snugly in your hands as you curl up on the sofa to read. What more could you want? And be sure to check out grimjinx.com in the coming weeks for a contest to win signed books, pages of new, original content including lost chapters, and a look at the Grimjinx family code. Finally, set your calendars: the last book in the trilogy, THE GRIMJINX REBELLION, will be available next year. If VENGEKEEP is a quest book and SHADOWHAND is a mystery, REBELLION is best described as all out action-adventure. I warn you now so you can fully prepare. You’re welcome. on October 22, 2013 at 12:51 pm	Comments Off on Y’all ready for this?